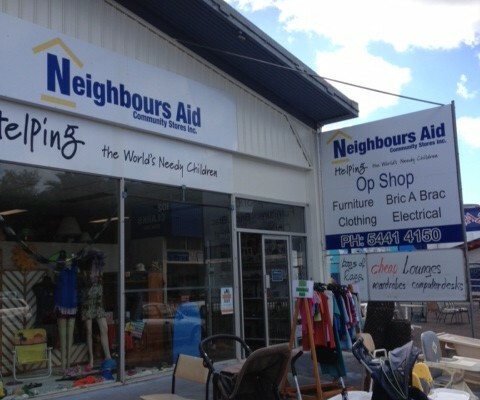 The Neighbours Aid family of over 280 volunteers and paid staff consists of a dedicated group of people who give their time and talents week after week at one of our stores to make a difference to the lives of some of the world’s most needy children. We are committed to help our environment by giving people the opportunity to REDUCE – REUSE – RECYCLE by donating their unwanted items or buying a pre loved item instead of something new, helping their bank balance in the process. Everyone can find a meaningful activity at Neighbours Aid, serving behind the counter, driving the truck, sorting, cleaning, ironing or repairing goods for sale. Long lasting friendships are made with other like minded people. Neighbours Aid contributes to the healthy breakfast program at Gulf Christian College in Normanton in Queensland’s north as well as the Neighbours Aid Perpetual Shield Award for a year 12 student at Nambour Christian College who has shown commitment to community service initiatives.